It has been a very long time since I have read a book that is so hard to put down. There was never a dull moment, and I was always eager to know what would happen next. This world and story is a brilliant creation, and has left me caring about all of the characters. 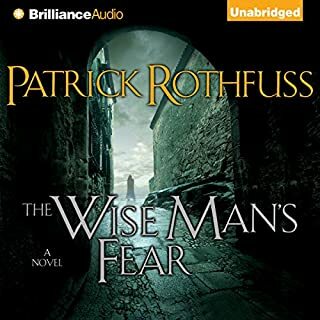 First audio book experience, blown away totally engrossing and believable. Both narrators have great execution. #Audible1 I am adding a written review in order to get into a draw, but still an excellent book. best book i have read in forever! Best book ever!! worth a look!!! I love the story. I love the performance. Kate Reading and Michael Kramer share the books narrative very well. this book is AWESOME. I am dying to get to the next one. narration was decent. not super great. there are definitely better narrators out there but they did the job and I didn't hate it. the story though...... addictive !!! loved every second of it! honestly one of the best books and audio books I have ever read or listened to! I couldnt stop listening to this book. The characters were relatable and i found myself caring deeply about them. I even found that a lot of the lessons the characters learned in this book I could put into action in my own life. I strongly recommend this book to anyone who enjoys fantasy. It has strong characters overcoming impossible odds, creative new takes on magic and creatures, and an interesting story that will get you hooked. 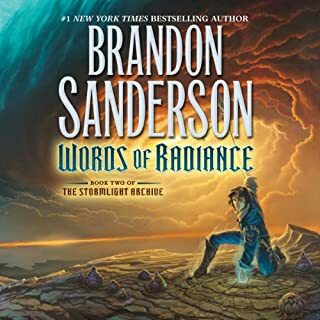 I have become a big fan of Brandon Sanderson's work and this new series does not disappoint. He has created another interesting world full of rich characters and I can't wait for book two. The same narrators from the Wheel of Time series re-unite with Sanderson to create another winner. 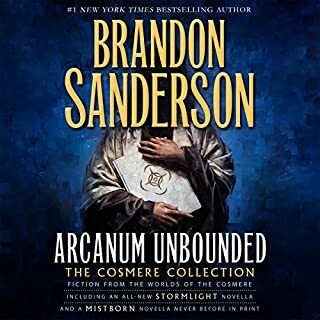 Mistborn, Warbreaker, Elantris, and now this work vaults Sanderson to the top of my must-read list. This book is so good I will gladly listen to it again as a refresher when book two comes out! 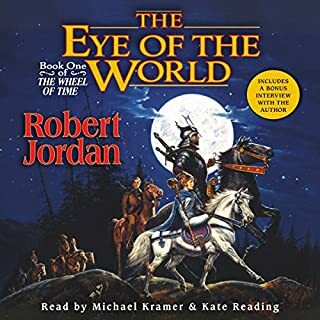 I gave up on the Robert Jordan Wheel of Time series by Volume 5 so never got to Brandon Sanderson’s concluding contributions to that series. 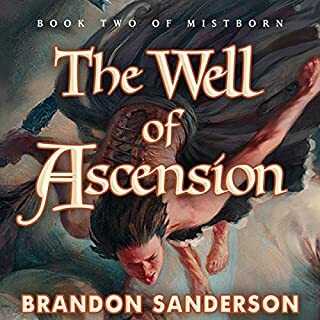 My first books by Sanderson were those of the Mistborn Trilogy. I was totally captivated by the story and its writing. 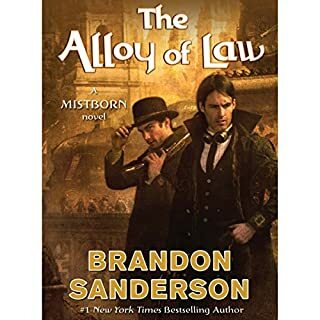 I avoided The Way of Kings because of its Audible 2 credit price but finally caved because I had lusted so long for something so good as Mistborn. I should not have delayed. 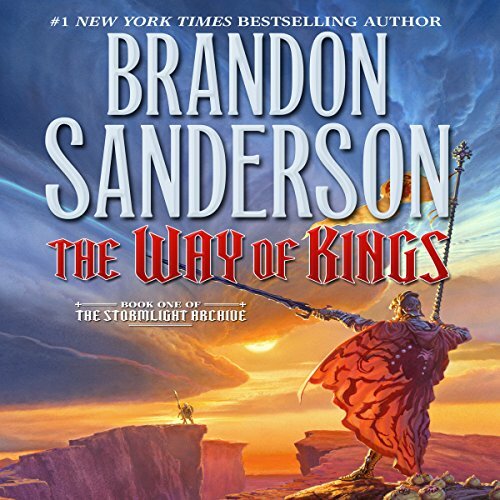 The Way of Kings was well worth the price and promises to be one of the best ever series by Sanderson or any SF/Fantasy author. 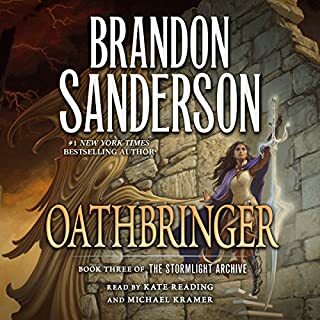 This is Book 1 of the Stormlight Archive. Coming in at over 45 hours on audiobook or over 1000 pages in print, for some TWoK might seem too lengthy. Personally, for me, it ended all too soon. The book was totally gripping and absorbing. I could not put it down. The writing contains wit and charm, adventure and philosophy, comedy and pathos. It’s all there, a wide range of human thought and emotion. While constructed of multiple arcs, the writing is completely straight forward, accessible and easy to follow. I became totally invested in each character and cared for everyone of the good guys and even some of the bad ones. One of the most interesting characters, one named Szeth, is a peace-loving believer in nonviolence but is also an ultimate, ninja-like assassin who hates to but is forced to kill and cries each time that he does. How’s that for a crazy mixed-up contradiction. Frankly, I think that Szeth is a metaphor for many of us and our behavior. But among my favorite and central characters were a peasant, apprentice surgeon named Kaladin and a spren named Syl with whom Kal has a rather magical and symbiotic relationship. Spren appear throughout the book. They were for me various types of conscious energy or spirit-like entities that were part of or associated with almost everything on the planet including specific kinds of thoughts and emotions, wellness and sickness, life and death. They particularly seem to appear when “change” happens and it is at least at this point in the series difficult to know if they are responsible for, contribute to or are just present when changes in anything from one’s health to the weather occur. Speaking of the weather, the environment and particularly the atmosphere of the planet and how the geology, flora and fauna have evolved within the influence of extreme weather is integral to the storyline. The book describes and develops half a dozen interesting and well defined fictional races. Wars exist on the planet among them over the power and dominance brought by the magical weapons known as Shardblades and Shardplates. And, while war is one of the central themes of the book, descriptions of battles and war do not dominate the narrative. What came across most movingly, uniquely clear and beautifully written were the two human qualities of love and compassion. I do not think that those two attributes have ever been more deftly portrayed than it is in this book. Some of my other favorite SF/Fantasy writers including Dan Simmons and Peter F. Hamilton while brilliant in almost every other respect, fail to adequately communicate those two essential qualities of our nature. Other authors talk about it, their characters go through the motions and maybe say the words but I just do not always “feel the love” in their writings like I do in reading this book. The humanity and heroism portrayed by some of the characters in TWoK were strikingly remarkable. 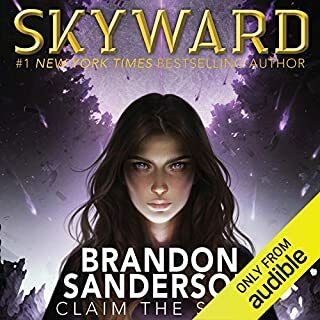 It is another one of those attributes of Sanderson’s writing that makes everything more real and capable of eliciting emotions within the reader. Magic abounds in the book and all of it seems to make sense if ever magic can be made sense of. It was once said that any technology sufficiently advanced will appear as magic and this is that kind magic, magic that can almost be but not quite understood. There is plenty of adventure and excitement contained within the pages and Kate Reading and particularly Michael Kramer bring it all to life. Yes, this is the same duo that narrated the Wheel of Time saga. Their talent was well highlighted there but I believe even more so in The Way of Kings. 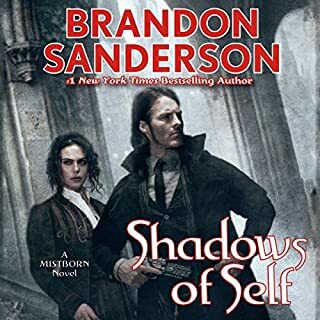 This was one great book and the only downside is that Sanderson is so prolific with his other literary pursuits that the sequel to this one is long overdue and the Audible rendition even longer than that. The Way of Kings is Sanderson's greatest work to date. the characters, the world, the story are all masterfully written, and truly comes to life with the reading of Micheal Kramer and Kate Reading. getting those two to narrate the book was a truly brilliant decision on the part of the publisher. I cannot say enough good things about this book. from beginning to end, despite the book's length, it held my interest like few books I've read recently. There really aren't any truly slow periods. there are periods without action, or without exposition, or without drama, but there is never a scene that feels unnecessary. 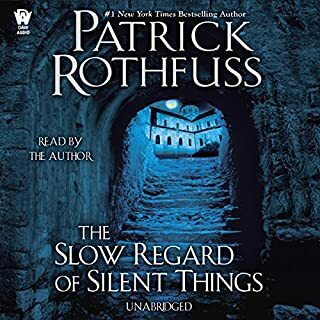 Normaly, i only listen to books when I am at work, but this one pulled me in so completely that i listened to it every free moment, and it even kept me up into the wee hours of the morning, unable to tear myself away. the last five or six hours were, hands down, the most riveting fiction I have ever encountered, and far beyond what one might expect from merely the first book of what is planned as a ten book series. Where the Wheel of time starts at a slow burn with The Eye of the World, The Way of Kings hits the ground running. The Stormlight Archive is the new face of epic fantasy, like the Wheel of Time was before it. Sanderson has truly come into his own on this one. It definitely earned a five star rating, as sweeping epic fantasies go. Sanderson takes us into the heads of each individual protagonist, and many of the 2nd level characters. The quotes are both creepy and portentous, as well as overdone and vague. The secret behind their harvesting is terrifying. This book starts with a quick dramatic plot point, and then ebbs and builds, slowly, until the last five or so hours, where everything gets tied together, and presents a promising setup for book 2. 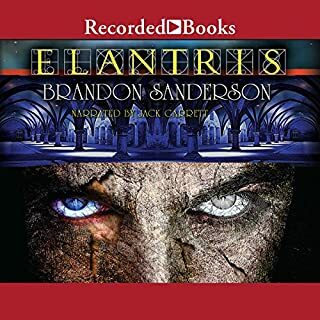 Brandon Sanderson's writing style, in this book, reminded me of Robert Jordan's; where you'd have these intricate meandering progressions, and suddenly a plot twist would rattle the storyline. 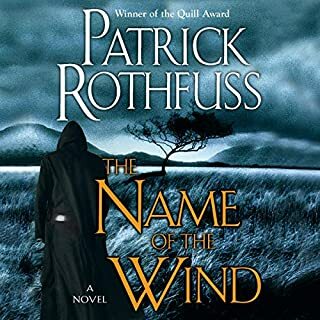 I feel it's worth the two credits, and regret waiting for the next book in the series, but at least we're guaranteed it will be out before The Winds of Winter. I'm not the biggest fan of Kate Reading's narration. Something about the way she draws out the words 'eyes' and 'oaths'. She has a great voice and she would be good for a single pov novel, and for R. Jordan's books, since his female characters are all so similar. She's not the best at diversifying her voices, or at male voices, so it's sometimes hard to tell who's speaking. Probably, it's just me, and I'm sorry I couldn't give the book a 5 star narration, as it deserves. I really, really enjoyed this book. The performances and story easily in my top five favorite Audible titles. 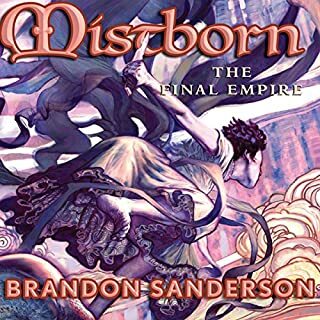 I was was introduced to Sanderson by listening the Mistborn series (which I enjoyed). Sanderson is very good at making his characters three dimensional as well as bringing his settings to life. He creates a full background and mythology for his characters that give a fullness to the experience of his stories. The performances here are top notch. I significantly preferred the sections performed by Michael Kramer but both narrators fit their main characters well and do a great job of creating separate, distinguishing voices for their characters. HERE'S THE WARNING: This book does not have a complete ending. I hadn't realized that book two isn't out yet. When I finished this book, I was ready to skip all of the other titles on my listening list and go straight into the next book. 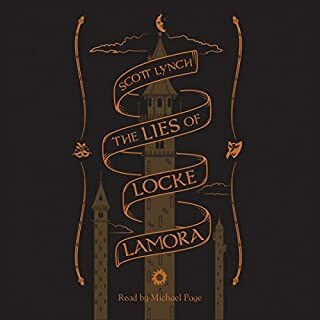 I've listened to enough preexisting series (Dresden Files is a good example) that I expected to continue the story when this book left me hanging. I know I'm spoiled and I'm whining a bit but hurry up! I was already feeling extremely impatient waiting for Rothfuss's next Kingkiller Chronicles (another don't-miss-it series with a similar epic feel to Sanderson's) but now I've definitely become a whiny-baby. The book does have a partially satisfying ending but, like most series premiers, it leaves many things unresolved and many questions unanswered. This book is still on my list of must-listens but be prepared to long for book two. I loved this book. Of course it was a little slow at first, but that's to be expected when background information is being given at the beginning of any long novel. The characters are well developed and you care about what happens with them. I got a little tired of the jumps back and forth in time, but that was only minor. The glaring flaw was in the narration. Michael Kramer and Kate Reading do a great job and unlike other reviews I have no problem with their style. Toward the very end of the book though the pronunciation of Sadius was changed by Kate Reading to the point where I was asking myself if a new character had been introduced somewhere that I missed. I soon figured out who she was talking about, but it's one of those little things that grate on the nerves every time you hear it. It doesn't seem too much to expect that pronunciation of names be consistent throughout an entire series let alone a single book. The producers should be embarrassed to put out a final product with such an amateur flaw. 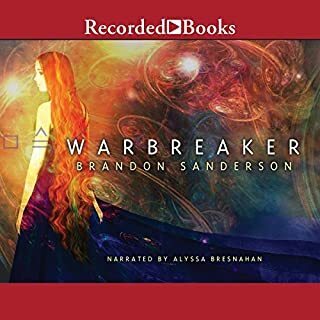 Audio books should be edited as properly as written books. I was pressured to download this book by a sci-fi loving boyfriend and sister. Since it was so long, and only one credit, I went ahead. I expected to let it sit in my library to get them off my back, but instead started listening to it while in traffic one morning. I stayed in my car for an extra 20 minutes in the parking lot because I couldn't get enough! I have seen some reviews that say the entire book is character development. Aren't all stories? The narration was incredible - as was the recording (although Kate and Michael pronounce one of the main characters names differently at the very end of the book which was a little confusing at first). I cannot wait for the next one! This is a very, very long book. When it ended, I wished it were ten times this length. By the end, I truly cared for all of the main characters, and I'm eager to know what happens next. 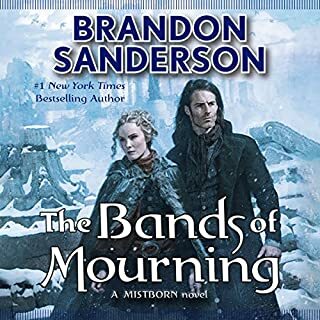 I didn't care as much for some of the intermissions, because they tended to focus on more disposable characters, but mostly just because I wanted to know what was going to happen to Kaladin, Dalinar, and Shallan. It's a great book, and I think it is required reading (or listening, I suppose) by every fan of epic fantasy. The narration is really good. It took me a little while to adjust each time the narrator changed, but both narrators were great. Best fantasy book EVER written!!! If I could give more stars I would. 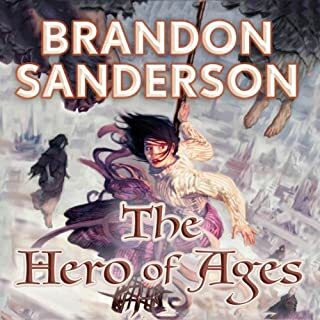 I am a fan of Brandon Sanderson's other works, along with the wheel of time series. 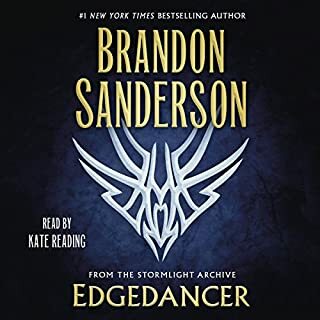 I also have listened to 'A Song of Fire and Ice' series, 'Harry Potter', 'Twilight', 'The Dark Tower', 'The King Killer Chronicles' and several other fantasy series type books. This one is by far the very best. There is not even a close second. Can't wait for book 2 to come out. Loved the story but struggled through narration. Eventually, discovered that I enjoyed it significant more after increasing the speed to 1.25. Also Kate Reading changed the pronunciation of a key character towards the end of the book which bothered me.